Samsung has played a major role in bringing affordable tablet computing into an ever increasing number of households, doing it’s best to produce devices that are significantly more powerful than the cheapest, non-branded tablets, with only a slight difference in expense. Identifying a trend that Apple only caught up with recently, Samsung have realized that people – and families – have different expectations from their tablets according to how they intend to use them. For example a single person may be happy with a smaller screen at a more affordable price (Samsung Galaxy Tab 4 7.0) for reading, gaming and watching video; whereas a family who may be sharing the device together will be better suited to the Galaxy Tab 4 10.1 thanks to it’s larger screen. This review is going to focus on the former and consider how the product weighs up not just according to it’s stand-alone specifications, but also as compared to it’s brother the 10.0 and, ultimately, how far the device offers true value for money. 2.1 How does it compare to the Galaxy Tab 3 7″? As should be expected Samsung have incorporated as much power as could be expected for a comparatively low priced tablet, thanks to their standing as one of the largest and most innovative developers in portable technology. However this doesn’t mean unfortunately that it’s chasing those leading the pack, if anything it is rather underpowered compared to the latest releases. But bear in mind it is around a third of the price – and is still overall a perfectly functional and capable device. Like all Samsung products it looks sleek, but doesn’t set out to stun. Made largely of plastic with a good quality glass screen taking up the entire front of the device, it feels sturdy enough but is so well finished the lack of any grip means it can slip quite easily unless kept well balanced or held. Weighing in at just over a pound it’s overall very well balanced and at around a third of an inch is thin enough to look nice and contemporary too. Buttons are well molded and perfectly functional, with a discreet Micro USB port and earphone jack. It’s not full HD – but this isn’t necessarily cause for immediate panic. As mentioned in the introduction people have different needs and expectations from their tablet, and unless watching video in super fine full HD is essential then it’s unlikely most users will complain at the functionality of this tablet’s screen. The 1280 X 800 (WXGA) pixels do make some fast moving or highly detailed scenes look a tad pixilated upon occasion, but the colors and contrasts are effective enough for casual use. Really this is as big an issue the user may feel depending upon their needs, most people who trial the product can’t really notice much of a difference. Those who have struggled getting to grips with Android in earlier incarnations will likely find that the TouchWizz has been scaled back and in turn encourages users to personalize their home screen as much – or as little – as they wish. This is quite a nice feature that is standard for Android systems but allows apps such as news, weather, google etc to be displayed immediately upon startup so you can get flying straight away. It’s an intuitive and easy to use system, nothing more, nothing less. Check out why 100+ Customers are Happy with 4.5+ Star Rating. The Samsung Galaxy Tab 4 7.0 features a 1.2Ghz quad core Processor from the Qualcomm family that is perfectly adequate for this kind of tablet. Note that word – ‘adequate’. Compared to much more expensive tablets it is noticeably more sluggish to load to complex websites (especially those featuring video plug-ins) or processor intensive games and apps. However the lag really amounts to no more than a second or two in almost all cases, and it really depends on what you may have used previously. Switching to this tablet from an $500 iPad will feel like it is – a noticeable step down in performance, but still perfectly functional for all tasks. If this is a first tablet or an upgrade from an earlier model, it will feel correspondingly faster and certainly a smoother experience. Like all tablets the expected life from a fully charged battery down to zero depends on usage and system settings – brightness especially. This compares favorably with other tablets in this price range, making it essentially an energy efficient device that should be expected to last up to twelve hours of use with standard settings or closer to nine if using constant video. The back camera is a reasonable but far from show stopping 3 megapixel and tends to produce correspondingly average results – yet tablets have never been really designed with photography in mind, especially larger screen models such as this. Sure it’s a nice feature to have but most smart phones include better cameras than those mounted on their tablet cousins, so unless this is a really important feature for intended use it’s probably worth not worrying about it to much. The front facing camera is less impressive (1.3 MP), but bear in mind that unless ‘selfies’ are a major priority then this camera is most likely going to be used on apps like Skype – that can be notoriously shaky and blurry anyway depending on connectivity and environment. Since we’ve covered quite a deal of features in this Samsung Galaxy Tab 4 7.0 review, it’s best to summarize into a bullet form so we can quickly recap the key points to consider about the device. Checkout the Official Spec Page at Samsung here. * It isn’t fully HD, and playback isn’t always crystal clear. * As websites and apps become more complicated, expect the tablet to load slower in time. * The camera is disappointing compared to modern smart phones and higher grade tablets. 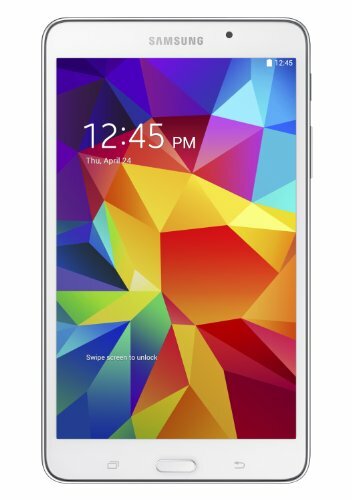 How does it compare to the Galaxy Tab 3 7″? In a nutshell this tablet offers advantages in simple functionality over the Galaxy Tab 3 7″ most obviously because it has the latest Android Kit Kat 4.4 OS that makes it superior for individuals or families using their tablet for a variety of different reasons. While the specs and architecture are nearly identical, the higher resolution screen (1280 x 800) comparing to Tab 3 (1024 x 600 only) in noticeably superior for gaming, especially with more complicated games where you need to tap the right icon every time. Likewise for movie playback, it’s in better quality, even just some more pixel makes a big difference and makes it easier to watch for those seated at angles too. Android Kitkat has been smart and manages power more efficient that gives it an overall better battery consumption than its previous model. Hopefully this Samsung Galaxy Tab 4 7.0 review has been helpful and demonstrated that it is an excellent choice for people looking for an affordable medium range tablet suitable and capable for performing everything that should be expected of such a device. It’s worthwhile looking at because while there may be cheaper options out there, the pace that the internet and app technology is developing is likely to leave these temptingly priced tablets obsolete very soon. However this tablet should provide good service for a few years at least, and is an especially good option when purchased carefully – keep eyes out for Tab 4 Tablet Discount offers that make it an even more affordable and quality choice.